Upon the conclusion of the Miss Universe beauty pageant, Miss Bulgaria Violina Ancheva announced that she wanted to hand down one of her preliminary competition gowns to "a girl in need [who] can't buy a dress for her prom the next month." Violina urged her social media followers to send her a personal message to express their desire for the dress. Below is her original post, which went viral. 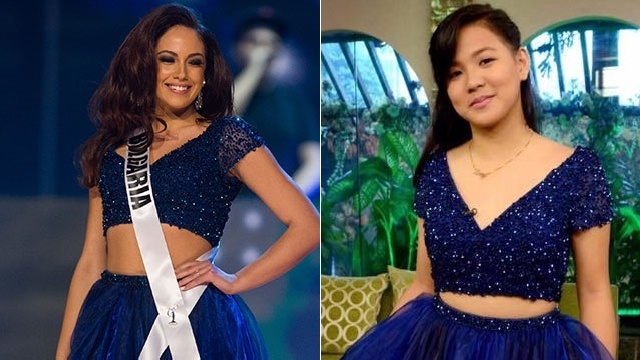 CNN Philippines later reported that Violina's midnight blue Sherri Hill two-piece gown already had a new owner: Issay Gallano, a single mother of two. Issay had asked for the gown so she could give it to her 15-year-old daughter, Zyra Nicole Cifra. The single mom admitted that she didn't have enough money to buy a prom gown for her daughter. But while a lot of people were happy for Zyra Nicole, there were those who resorted to bullying her because she "didn't look poor." As such, they decreed that she didn't deserve to get Violina's gown. These nasty comments, though, didn't escape Violina's attention. Violina got in touch with CNN Philippines to call out the people who were attacking Zyra Nicole. "It's hard to believe that it is possible [for] somebody to write negative and rude comments to one 15-year-old girl. The decision to give this dress to this girl was mine and you have to respect my decision," Violina told the haters. She added, "[The] sparkle, the dress, the heels, the [jewelry] aren't the most important thing in your life. The most important thing is your heart. You teach me that we have to be better [people]. And one day, all of us can be in need, and we have to be ready to help each other and not to be rude. So people, please stop. Please."